On December 31, 192 AD, Roman Emperor Commodus was assassinated by his own inner circle, setting the stage for The Year of the Five Emperors in 193. A typical Roman emperor egomaniac, Commodus saw himself as a demi-god and often had himself depicted as Hercules. Robust physically, he often participated in gladiatorial events, and his character was played by Joaquin Phoenix in the 2000 movie Gladiator (with Russell Crowe in the title role), a Best Picture Oscar winner. On December 22, 2015, we featured an article about the hazards of serving as Emperor of Rome starting with the events of 69 AD, known as The Year of the Four Emperors. Today, it is easy to see what we were referring to when 192 AD was even more chaotic for the health of the Emperor. Commodus was poisoned by his own mistress, Marcia, but when he vomited up the poison, his wrestling partner Narcissus was dispatched to strangle Commodus in his bath. Commodus was replaced on the throne by Pertinax, who only reigned until he too was murdered (by his own Praetorian Guards) in March of 193. The next in line was Didius Julianus, who only managed to survive until June of 193 when he was murdered by a soldier in retribution for dismissing and executing the Praetorian Guards that had killed Pertinax. Septimius Severus then made the dangerous move of ascending the throne of Rome, only to turn over the position of Emperor to his son, Caracalla, who ruled jointly until 211 along with Septimius. When Septimius died in 211, his other son, Geta, who was made co-Emperor with Caracalla and Septimius in 209, was murdered shortly afterwards by Caracalla less than a year after Septimius died. Caracalla himself was in turn assassinated in 217 by the Prefect of his own Praetorian Guard. Portrait of the emperor Caracalla from a statue reworked as a bust. Photograph by Marie-Lan Nguyen (2011). With the incredible shenanigans that went on among those at and close to the throne of Rome, it is amazing to us that the Roman Empire did not disintegrate and fall much sooner than it actually did. Can you imagine having five Presidents of the United States in one year? Especially if they were killing each other? 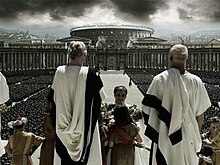 Question for students: What is your favorite film about the Roman Empire? Please share with us your opinions. There are certainly many such films to choose from. 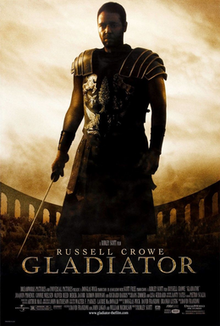 Several scenes in Gladiator included extensive use of computer-generated imagery shots for views of Rome. McHugh, John S. The Emperor Commodus: God and Gladiator. Pen and Sword, 2015. Gladiator. DVD. Directed by Ridley Scott. Warner Bros., 2003.